Review - Sam | A Savings WOW! 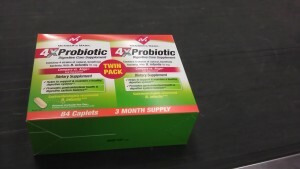 With four children at home and what seems like a million things on our to-do list, both of us decided to try out the Member’s Mark 4X Probiotics. We’ve been using it for about two weeks now and it has helped our digestive system greatly. Between sometimes not getting enough sleep and the weather changes, we started to feel like it was taking a toll on our bodies and even started feeling like we may be coming down with colds. However, after taking the Member’s Mark 4X Probiotic for only a few days, we felt our bodies bouncing back. It definitely has made a difference for us in helping us feel less rundown and more ready to accomplish what we need to in a given day. With the Sam’s Club pack, we definitely will continue to take them because we don’t need to run out every time to get more since the Sam’s Club twin pack lasts for 3 months. We definitely would recommend it to those who want to have more of a balance in their digestive health. You can find Member’s Mark 4X Probiotic at your local Sam’s Club location. We found ours for $28.88 for the twin pack, which includes a supply for 3 months. Find your nearest Sam’s Club location and purchase your Member’s Mark 4X Probiotic today! Disclosure: This project has been compensated as part of a #DigestiveHealth shopping mission for Sam’s Club with #CollectiveBias. All opinions are our own honest opinions.